With incidences of maritime terrorism and hijacking on the rise, issues pertaining to security of merchant ships have also come under scanner. The International Ship and Port Facility Security (ISPS) Code has therefore been brought into action to enhance the security standards of the ships and ports which entertain these ships. In the article ISPS Code: The 9/11 After Effect, we discussed the significance of ISPS code in the present times and how the matter of ship security is now being taken with utmost seriousness. A ship at the port and a ship at the sea have almost an equal amount of threat to its security. Several steps have been taken to enhance the security of ships both at the ports and at the sea. It is only through an organised and cooperative structure between the ports (Port Facility Security Officer-PFSO) and the shipping company (Ship Security and Company Security officer), can the level of security be improved. If you are a part of a ship’s crew (no matter which department you belong to), it is your duty to take all measures required to protect the security of your ship and its crew. Having the right attitude can save the ship and its crew from all unwanted troubles. Mentioned below are ten ways in which you can help to enhance the security of your ship. 1) Be Vigilant – Always: All the crew members (either on or off duty) must always be vigilant at all times. An alert crew can eradicate a problem way before any emergency situation can take place. 2) Guard the Gate: It you are duty officer while the ship is at port, make sure that the gangway is properly guarded and no one enters the ship without an ID check or authorisation of ship’s captain. Also keep a close watch on the records of entry and exit of visitors. 3) Ask and interrogate: If you see a visitor without an ID card or find an unfamiliar person, do not hesitate to ask and interrogate him for his identity. Ensuring that all the entries in the ship are authorised is the first step towards enhancing ship’s security. 6) Supervising Cargo Operations: It is very important for ship officers to know which cargo is being loaded along with its whereabouts. Several cases of stowaway have been registered in the past during cargo operation on ships. Keep a proper check on stevedores and the cargo which is being loaded on the ships. 8) Update Your Knowledge: Knowledge of current issues such as various reasons of security threats, detection of dangerous substances, unauthorized devices and their effect is an important aspect of ship’s security system. This can be achieved by providing regular training and literature updates to the ship’s crew. Marine Insight provided weekly updates on subscription. 9) Identify the Weaknesses: Every system has its weakness and if not identified in early stages, can lead to dangerous situations. 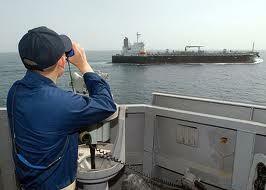 Survey your security plan, crew performance, security equipment,duties of ship security officer etc. and phase out every loop hole out of them. 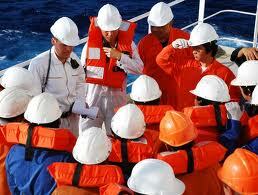 10) Regular drills: Last but not the least; seafarers should know how to tackle an emergency condition. To ensure all the above points are followed religiously, regular security drills and safety meetings should be organized by crew members.